Looking for the perfect chocolate truffles? Look no further as we offer an extensive collection of scrumptious, handmade chocolate truffles, all elegantly presented in beautiful designer boxes. From ballotin boxes boasting Belgian chocolate truffles to indulgent tiers of truffles, all of our mouthwatering truffles are stylishly packaged and wrapped with a luxury satin ribbon, which can be personalised with a special message for free. 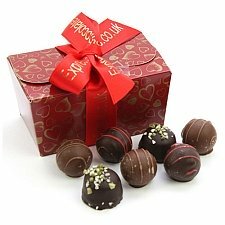 Why not select an additional gift alongside your delicious chocolate truffles? Choose online from beautiful bouquets of flowers, cakes, balloons, teddy bears, fruit baskets, gift hampers and more. Our exceptional first-class chocolate delivery service by post guarantees trackable next-day delivery (except Sundays) on orders received by 2pm the previous day and your gifts can be delivered anywhere in the UK or internationally to the USA, Canada, Europe, Pakistan and the UAE. Ordering is easy and our friendly customer support team is available 24/7. Send chocolate truffles today!